Confessions of a healthy food fanatic: I used to like burgers. The ones from well-known fast food chains. I used to crave them regularly, e.g once per month. Luckily, we moved to a spot that is far away from any take-away or home-delivery food place. So food would arrive only lukewarm or cold. That's fine with Indian food as you can heat it up again. Not so cool with burgers or pizza. Perhaps it's just yet another detail that led me to eating healthier and preferring home-cooked dishes. Although I still like the burger idea in general. However, this burger recipe is amazing. The combination of nuts and lentils as main ingredients make it a health bomb. I made a few minor changes to the ingredient list and grilled the burgers instead of frying them as my family is not used to fried foods and generally reacts with sore tummies. It turned out really well. The burgers were just right with all these spices. I will definitely make these again, as they are being put together very quickly (as long as you have the lentils ready). Just one tip: eat them as soon as you make them. Leftovers tend to get a little on the dry side. In the bowl of a food processor, combine walnuts, breadcrumbs, garlic, chili flakes, cumin, coriander, 1/2 teaspoons salt, and 1/4 teaspoon pepper; process until finely ground. Add cooked lentils, onion, and olive oil; pulse until coarsely chopped. In a large bowl, whisk the egg. Add lentil mixture; mix until well combined. Divide into quarters; roll into balls, and flatten with the palm of your hands into 3/4-inch-thick patties. Place patties on a slightly greased baking sheet and grill for 8 minutes. Turn over and grill for another 6-8 minutes. 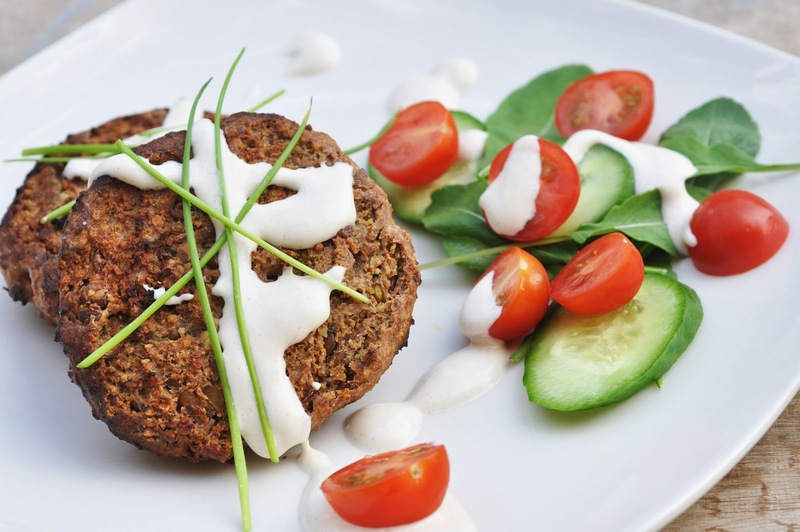 Serve immediately with Tahini sauce on burger buns or pita bread with a mixed salad. Mix the Tahini and the yogurt. Add water little by little until you get the right consistency, not too thick and not too runny. Add salt for seasoning.